Contents: Boiled buckwheat (aluminium bowl in the middle). Sugar (in the dish near the bowl closer to us). Podliva (in a dish near the bowl further from us). Poldiva is sort of like gravy. It's ingredients are: a) water b) fat c) 4-10 little pieces of canned stewed meat. One egg per person. Tea. Butter (on the right in the "triangle"). White bread. Black bread. Soup. Notes: Although not technically a school, lots of these soldiers are school aged kids. Hi! I am from Russia. In this photo, not school. This is a military school (we have there in like the army). A simple meal. But probably more edible than your average MRE. I'm from Russia and i think they should feed our boys better! 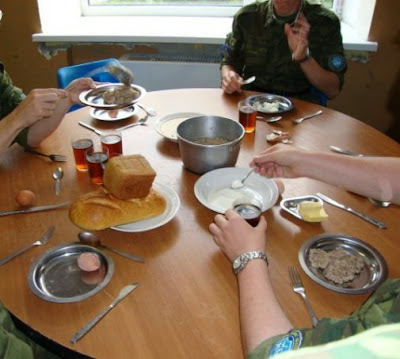 Although i LOVE boiled buckweat and podliva, but sinse it's military school where the majority of students are boys, they should get some meat, lots of meat.